The chart below sets out the treatment reported on the HCAI system by healthcare profession. 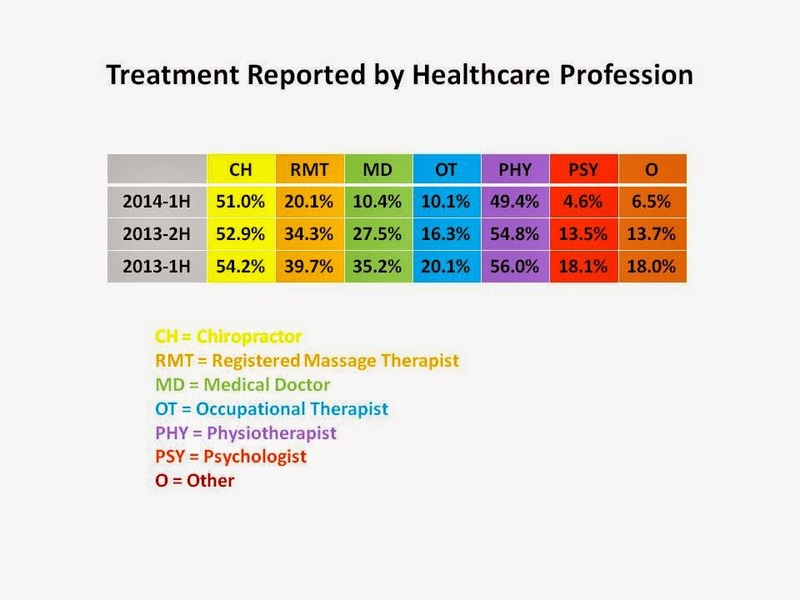 It shows that the majority of claimants see a chiropractor or physiotherapist which is expected since the majority claims are strains and sprains. But as the claims develop, claimants are seeing additional healthcare professionals. In the most recent accident half year (first half of 2014) claimants saw an average of 1.5 professionals. For the second half of 12013, claimants saw an average of 2.1 professionals and in the first half of that year 2.4 professionals. The largest increases in interventions for older claims relate to physicians and psychologists. Because the data includes both treatment intervention and assessments, this is expected outcome. Older claims are more likely to undergo an independent medical assessment or a psychological assessment. There appears to be minimal growth in chiropractic and physiotherapy interventions over time.